SpaceX provided an update Tuesday on last week’s test of a Falcon 9 v1.1 first stage landing during the launch of six ORBCOMM satellites. 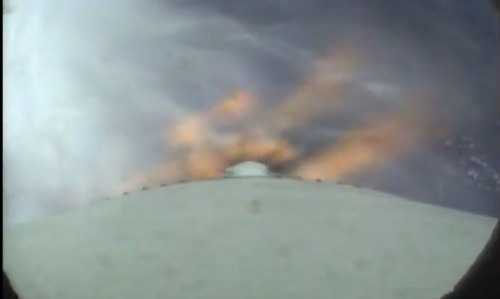 The company released a video that showed the first stage, after separating from the upper stage, firing its engines for a reentry burn to slow down. Later, the engines fire again and the stage’s landing legs deploy as it approaches the ocean surface. SpaceX said the rocket did a soft “landing” on the ocean surface and remained upright for a few seconds before toppling over to the horizontal position. That fall caused a “loss of hull integrity” in the stage, but did not prevent SpaceX from collecting the information it needed for that test. One glitch with the test was ice that formed on the camera filming the stage’s descent. The company said it is “taking steps to minimize the build up of ice and spots on the camera housing” for future flights. SpaceX will stand down from these landing tests for the next two Falcon 9 v1.1 flights. “However, our next couple launches are for very high velocity geostationary satellite missions, which don’t allow enough residual propellant for landing,” the company explained. Those launches are of the AsiaSat 8 and AsiaSat 6 satelites, with the first tentatively scheduled for early August. SpaceX also did not attempt landing tests on launches of two other GEO satellites in December 2013 and January 2014. “We will attempt our next water landing on flight 13 of Falcon 9, but with a low probability of success,” the company said. That would be the fourth Commercial Resupply Services (CRS) mission for NASA, planned for no earlier than September 12. The company didn’t explain why that mission had a “low probability” of success given that the most recent test appeared to go well. The following two launches would attempt to land the stage on a “solid surface,” although it’s not clear if that would be back at Cape Canaveral or on a barge or other platform in the ocean. SpaceX said it has been in discussions with the Air Force to identify locations at Cape Canaveral Air Force Station to support Falcon 9 landings. Those two tests, the company added, have “an improved probability of success.” Those launches, according to the current manifest, are of the second group of ORBCOMM Generation 2 satellites and the fifth CRS mission. I also enjoyed the use of the term “solid surface”. I noticed in the announcement a reference to a floating launch pad (first time I’ve ever seen that in writing from SpaceX) so it seems they’re is intentionally keeping its options open on exactly what the returning booster will land on. As usual, the future is tantalizingly close! Last year, SpaceX attempted a first stage water landing, but was not successful. Their two most recent successes on this front had at least two hardware differences from that old attempt: landing legs and heavier duty RCS thrusters. However, due to some combination of manufacturing and launch scheduling, an old core without these improvements, similar to their attempt last year, will be flying on flight 13. Howard- that’s a good tidbit to know! So much for my wild theory. Just a thought SpaceX, if you find that keeping the stage stable after soft landing becomes to problematical, use three bat gizmos to fire out from the top of the stage just after touchdown to help with anchoring it to the deck. Elon, just a tip, have a chat with Bruce Wayne. LOL.